Much of what I have learned about the relationship between photographs and feeling – and the two are deeply connected – comes from the writing of Galen Rowell (1940-2002), a pioneer wilderness photographer and mountaineer. In an essay from his classic and still highly recommended book, “Mountain Light,” Rowell writes about his path to understanding that his best work resulted when he took pictures at the emotional “high points” of a difficult alpine ascent. When I’m out patrolling an unfamiliar landscape, I pay close attention to my emotional response to what I am viewing, as measured by my heart rate. 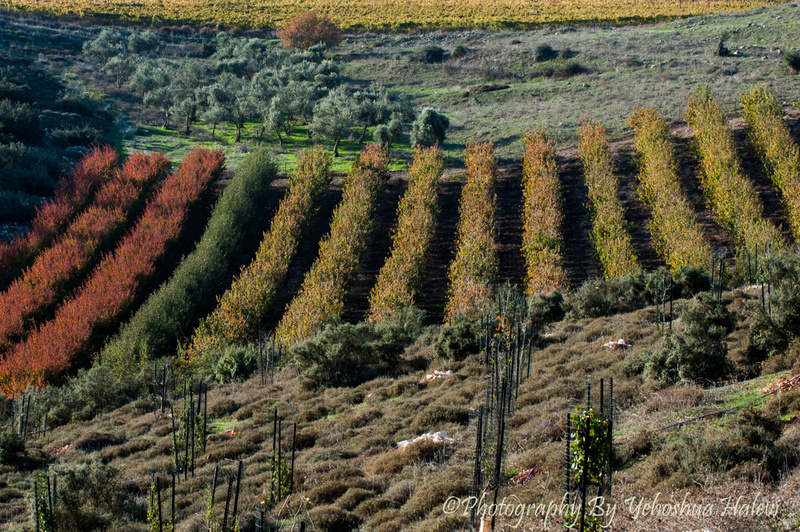 When my eyes feasted on this unusual orchard in the Galilee, below Tzfat and not far from Mt. Meron, I felt like a fisherman as that first nibble tugs at his line. A rush of adrenalin coursed through my veins and my heart rate picked up pace. I hopped a fence (erected to keep cattle, not humans, from a vineyard), scrabbled over a few boulders and landed in this position above a rather odd though neatly arrayed collection of trees. I tried to move closer to the trees, but that only brought me further down the hill and I began to lose the elevated perspective critical in large landscape photographs. I stayed put and threw a long, tripod-mounted telephoto onto my Nikon D-700 body. With the help of a resident expert on tree identity, we determined the unusual mix of color seen here results from peach (red-orange), apple (green) and sweet cherry trees (yellow-gold). The carefully planted rows remind me of a piano. Finding this photo was certainly a high point to my morning and pleasant music to my eyes.